"Surprises around every corner" and "double-takes” are hallmarks of The Camby, so it's no surprise that their new Tipsy Tea Party is uniquely delightful. This boutique hotel brings a modern flair to this usually sedate pastime with a combination of boozy tea-infused cocktails and elevated finger food by Chef Dushyant Singh, one of the Valley's shining stars. 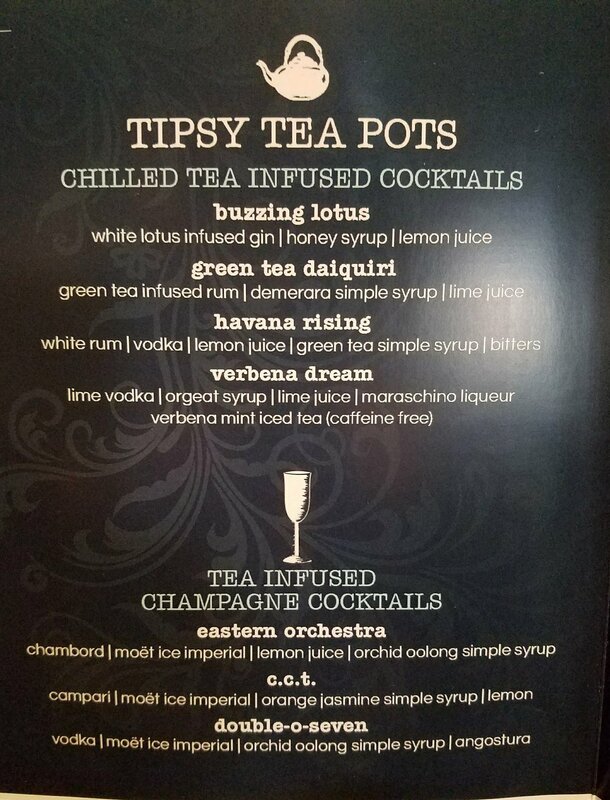 I was recently invited to spend an afternoon at the elegant Bee's Knees Lounge at The Camby, where Tipsy Tea is offered every Friday and Saturday. The cost of $40 per person includes a champagne cocktail or one teapot (containing two to three drinks) and one of every dish from the prix-fixe menu of savory and sweet bites. Guests can choose from cold teapots, hot teapots, tea-infused champagne cocktails, and bottles of champagne for a separate cost. If you're lucky and Nicole Ellington is working, she'll deftly guide you in choices, such as the smart suggestion to order a cold teapot with the savory dishes, and add a hot to pair with the desserts. We started with cocktails using Moët Ice Impérial champagne. I loved my C.C.T., which combined Campari, jasmine tea simple syrup, and lemon with champagne, while my husband was just as happy with his Double-O-Seven with vodka, orchid oolong simple syrup and angostura bitters. I wanted to sample a variety of teapots, so we sipped on the potent Green Tea Daiquiri with green tea-infused rum, lime, and demerara simple syrup, and the light and refreshing Verbena Dream with lime vodka, lime juice, orgeat syrup and verbena mint iced tea as we enjoyed a wonderul selection of savory bites: Crab sliders with mango and avocado, truffle deviled eggs with a hidden layer of potato chip dust, fried cherry green tomatoes dusted with BBQ seasoning and served with preserved lemon aioli, bruschetta layered with herbed ricotta, green apple, and Jamón Ibérico, aji amarillo tater tots garnished with caviar, and an addictive sweet and tangy marinated cucumber, radish, and carrot salad. To enjoy with dessert, we took Nicole's suggestion of a hot pot of Spiced Pear Toddy made with bourbon, lemon juice, demerara simple syrup, spiced pear liqueur, and Earl Grey tea. I can't wait to return with local and out-of-town friends and family. And it's not just for the ladies! My husand enjoyed this as much as I did, declaring his cocktail one of the best champagne cocktails he's had and that Chef Singh's food was absolutely delicious.